1. this is sort of what I figure a mouse's point of view would be. 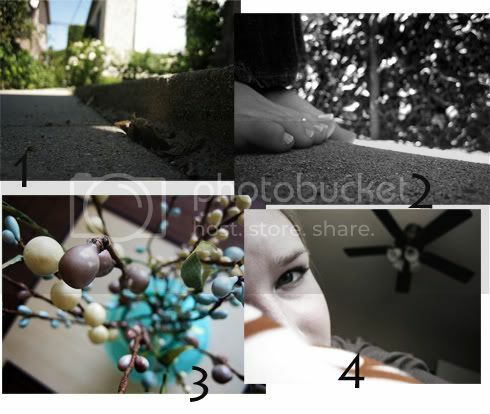 2. toes on the back step. 3. flower-like nubbins in my favorite vase. 4. verging on a nap. Not sure which one to enter, yet I'm running out of time. Eeep! Ooh! I really like those flower like nubbins! They look great in the vase! Your toes are pretty! Although, I also am voting for the flower one! Oh GOOD! You choose my favorite one! I like the nubbins, but they're all a great example of a different perspective. I love the colors in #3. That's my favorite. Love #3, and loove the your cute toes in #2.